The Blue Lagoon Resort is a recently built luxurious complex with 600 guestrooms; 1-storey main building, six 2-storey accommodation buildings and 3 satellite buildings built nearby the sea. The Hotel area is almost in contact with the sandy beach at a distance of 75m. 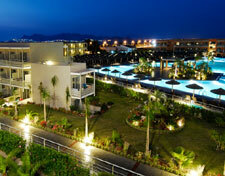 It is located only 2 km from the centre of Kos Town, 22 km from the airport and 1.5 km away from the nearest shopping area. The hotel is ideal hotel for families, couples and groups, offering a comfortable and noiseless relaxation for adults and a safe playing area for children. There are 5 pools in the hotel, one luxurious swimming pool for adults (4000sq meters) and a smaller for children (200 sq meters) at the main complex and 2 swimming pools for adults and a children's pool at the satellite buildings. Surrounding the pools and the hotel are 60,000 m� of beautiful breathtaking gardens. The Blue Lagoon Resort, in harmony with the picturesque landscape, offers overwhelming views. Open from mid April to end October provides comfort and warm hospitality that attracts both foreigners and Greeks. We provide an abundance of natural beauties and crystal clear waters lapping onto inviting beaches. It's not just a place for people who love the sun it�s also far away from the inconvenient noise and offers a friendly and peaceful environment for relaxed and unforgettable vacations. You can choose between sunbathing all day, joining our activities or just enjoying the magnificent sunset from your balcony only a few meters away from the sea. For those who wish to create the best choice of both quiet relaxation and entertainment our resort guarantees you a memorable vacation.